In a media landscape filled with touchscreens, flat displays, projections, and virtual reality goggles, immersion in a data landscape is a fairly common experience. Simply put on a headset with some form of VR software, and magically be transported to a 360-degree virtual landscape of your choosing. Whether it is a gaming environment, or a virtual instruction manual—complete with technician—to help fix your kitchen sink, virtual spaces are growing daily, along with our ability to engage with them. 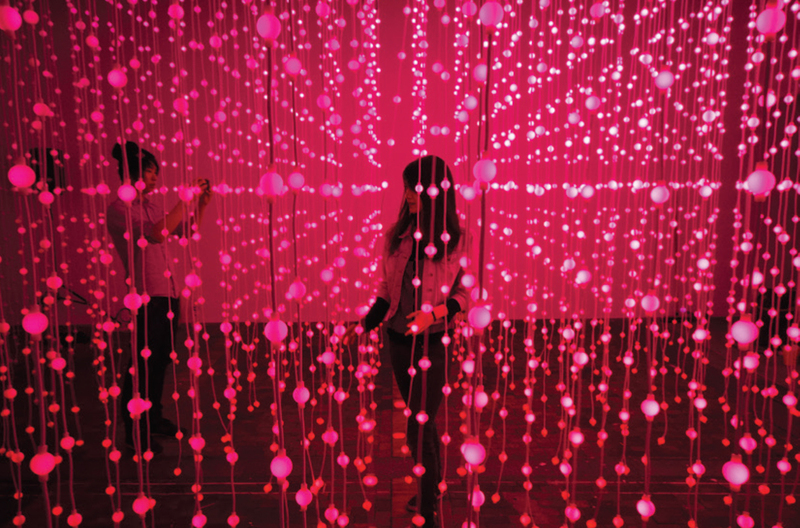 Submergence, a large-scale LED sculpture and immersive space by U.K.-based collective Squidsoup, brings virtuality into physical space in the form of a walkthrough environment consisting of 8,064 individually addressable LEDs suspended from a ceiling. Submergence is intended to create feelings of presence, movement, and envelopment as one interacts with it. Contrary to the VR headset, the physicality of this environment challenges the ways in which we experience data and makes us think more creatively about how information could be represented in tangible spaces. Going beyond the ways in which we experience data on a daily basis, the ability to visualize the presence of data on a scale larger than our own bodies is important for our understanding of its immensity. 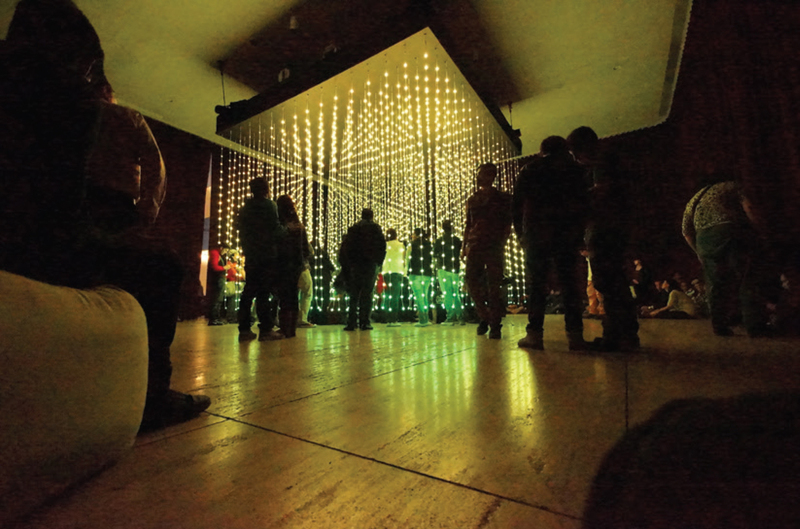 Submergence utilizes widely available electronics boards, inexpensive LED lights, and open-source software platforms to create a lively and immersive installation that envelops its users in continually changing data representations. The installation’s form of display not only fills a space with emanating data flows and information pathways, but also illuminates potential pathways for users to meet midway through the structure. Thus the work functions as both a data sculpture and a social space for candid public interaction. Submergence is both a reflective space and a fluid space for data retrieval, giving presence to the reflective nature of our social and technological worlds as they intersect.